Helensburgh Rotary Club now has its first lady member. Travel agent Linda Harvey was one of three new members inducted by outgoing president Douglas Dow at the weekly luncheon in the Royal Northern and Clyde Yacht Club at Rhu. Also joining were medical insurance broker Henry Deane and surveyor Jim Aitkenhead. 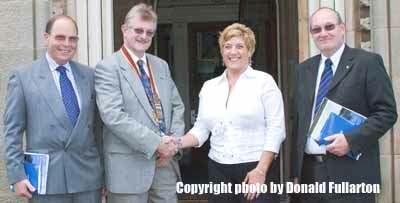 The ceremony was followed by the handover, with Mr Dow passing the chain of office to his successor, Derek Hall. Picture from left are Henry Deane, Derek Hall, Linda Harvey and Jim Aitkenhead.